When you have a weeding problem as big as ours, the tendency is to turn to the trusty Hula Hoe. It's been around for years. It does a great job most of the time. But for me, it strains body parts, that don't need straining anymore. The back and forth movement, limits how long I can use it. Enter the 'Shov-a-Hoe'. I made this tool a few years ago. It worked much better, and there wasn't the strain, on my tender body parts. Using a shovel to cut weeds is not new. 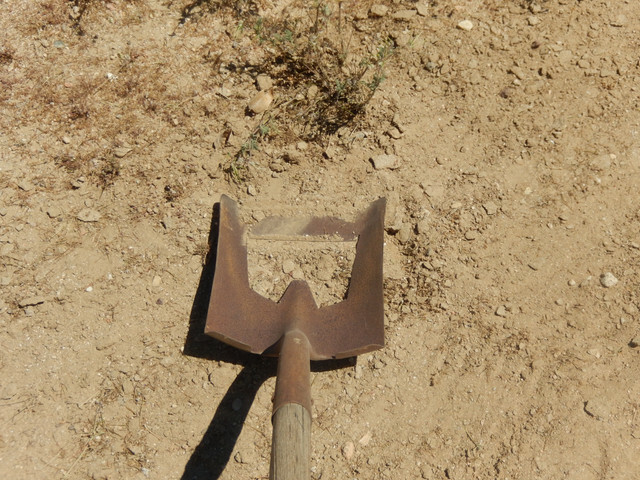 But I was always having to deal with a lot of dirt on the shovel, which made it heavier than necessary. So I cut out the center portion of an old shovel I had. Sharpened the remaining 'blade' to pointed teeth. 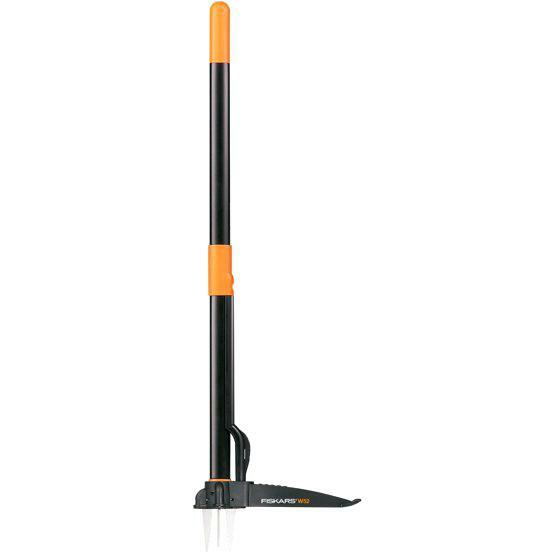 The blade works well to cut the weeds, while most of the dirt, goes through the shovel. 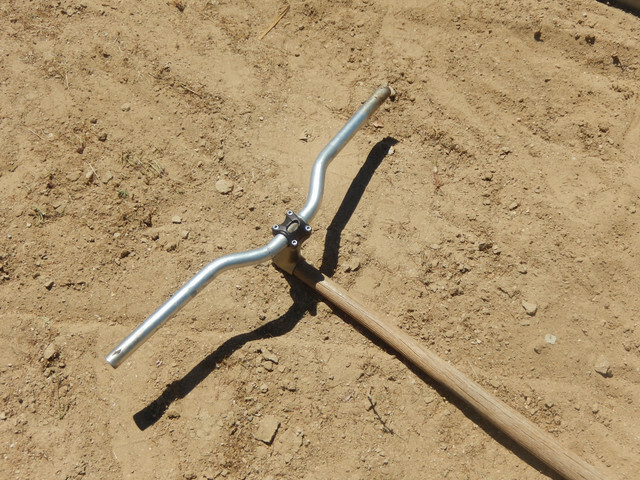 A plus with this 'prototype' is, it still works much like a shovel, and can be used to pick up most of the larger bulk weeds. Something that can't be done with a Hula Hoe. 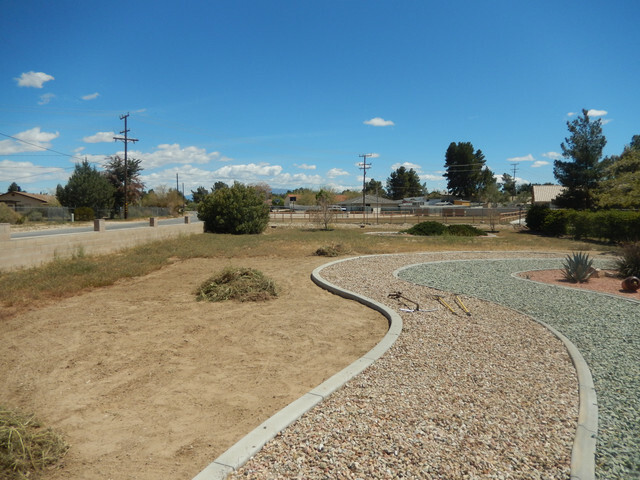 When picking up a pile of weeds, a lot, if not most of the dirt falls to the ground. Voila, most of the problem of strain and dirt, seemed to be solved. It only had limited use, as the weed problem wasn't as severe as this year. However as time working with the Shov-a-Hoe added up, the strained body parts returned, though much less. I started using it this season, with the thought of improving it, where needed. The first idea was to adapt a similar handle method, to the wheeled hoe's I found online. 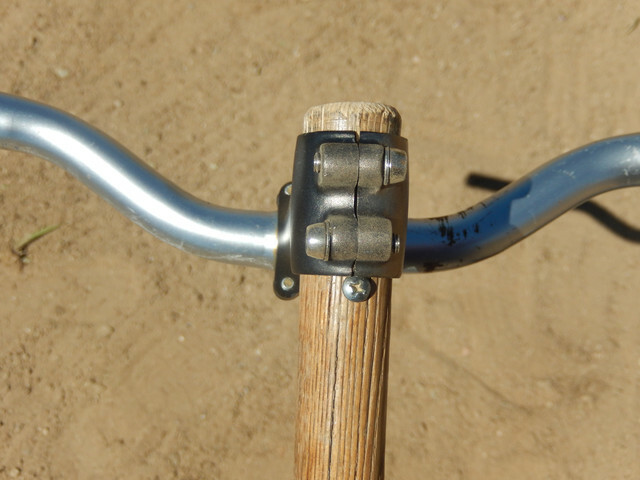 might be the answer, as they seemed to use bicycle handle bars or similar. I was in luck. I just happen to have an excess number of bicycle parts. 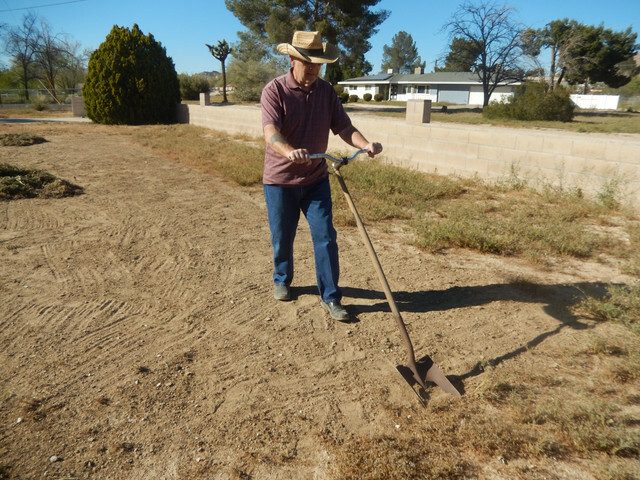 While using the standard shovel handle, I needed to force the shovel into the weeds hard at times, to get it to cut the weeds. Doing this meant, pushing on the very end of the handle, which by the end of the work day, left me with a very sore palm. And it also caused a twisting of the body, and you guessed it, straining that very delicate body part again. The handle still tappers, just a might, so a retaining screw was used to keep the goose neck in place. Final analysis of this remarkable new tool, is that it works better, and faster than a Hula Hoe. 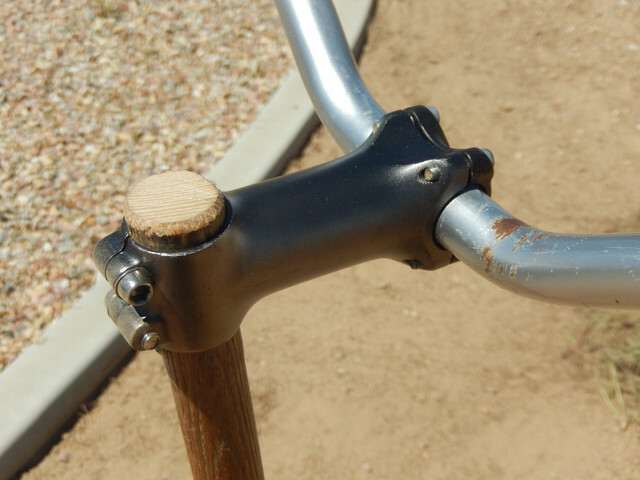 Using the handle bar set up, places virtually no strain on those lower body parts. The handle also worked to lessen the amount of effort needed, to cut those hard stubborn weeds. Doesn't work well in rocky terrain. Its been quite some time since I was throwing 50-60 lb boxes around, or carting 400 lbs around on a handcart. So I have been reintroduced to muscles, that haven't had to work much, since I retired. I worked this new tool, all of what you see in the photos, ( about 3 hours) just today. I used virtually all upper body muscles, arms, neck and upper back. I expect to be a bit sore tomorrow. But I didn't strain or hurt those tender body parts. I think this new tool is a keeper. Anybody seen the 'horse liniment'? What sort of 'gadget' ? My better half keeps wanting to pull them out by the roots. But in our dry hard soil, most of them just break off anyway. 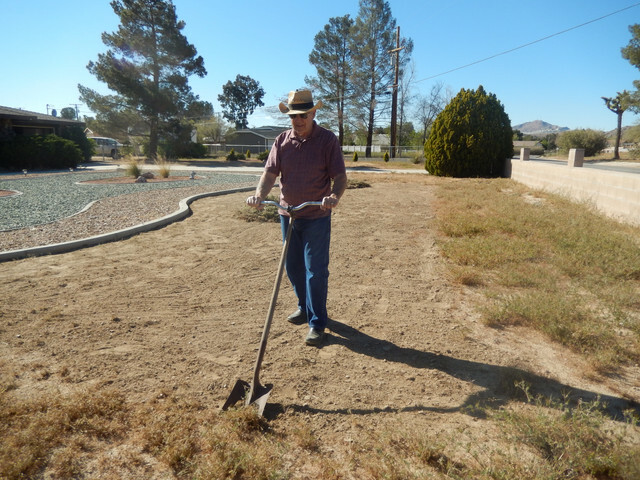 In the looser or sandy soil we can do that, but its back breaking work, and takes ...FOREVER ! I will be more diligent about weed killer from now on. Also, I'm doing better than expected, this morning. No noticeable soreness. I am familiar with that product brand. 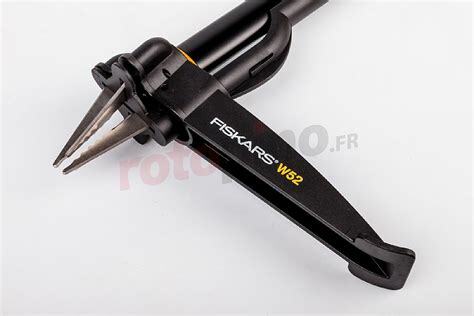 I have some cutting tools from them. I'll check it out locally.